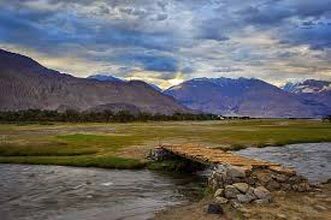 Flights to Leh are almost as spectacular as our Markha Valley trek. The view of the high snow capped peaks is quite simply put mesmerizing. Landing at Leh is an adventure in itself as the airport strip is between mountains on both the sides. Leh airport is around 6 km from Leh city. Check-in to a hotel and get briefed on the day’s program. 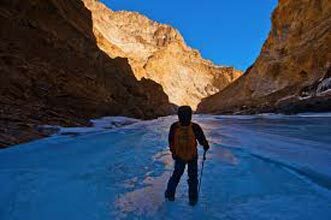 Leh is at an altitude of 10,000 feet so acclimatizing yourself to hight altutude is important to enjoy trekking in Ladakh. Rest for the first half of the day and in the evening go for a walk to the Leh market. 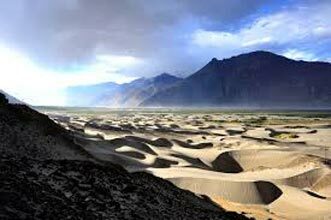 Go out and explore Leh before the start of the Markha Trek Ladakh. Try a cup of traditional ladakhi butter tea and ladakhi bread for breakfast. 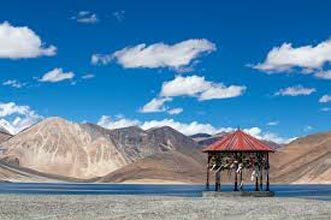 Some of the famous places to visit in Leh are Shanti Stupa, Leh Monastery, Leh Palace etc. Thiksey Monastery: Thiksey Gompa is around 22kms from Leh on the Leh Manali road. This has to be one of the most impressive monastery complexes in the Leh vicinity and resembles the Potala Palace of Lhasa, Tibet. This brightly coloured monastery set against the deep blue sky looks spectacular, especially when viewed from a distance in the sun. Thiksey Gompa (Monastery) also has good restaurant that serves authentic Tibetan food. 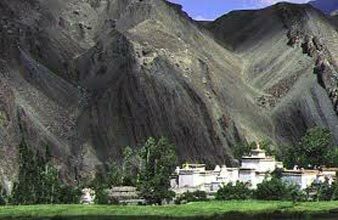 Shey Palace: The Shey Monastery or Gompa and the Shey Palace complex are structures located on a hillock in Shey, 15 kilometres to the south of Leh on the Leh-Manali road. Shey was the summer capital of Ladakh in the past. Magnetic hill: They say the magnetic hill has magnetic properties strong enough to pull cars uphill and force passing aircraft to increase their altitude in order to escape magnetic interference. You can go to Magnetic hill and find out for yourself the true story behind this mysterious hill!!! 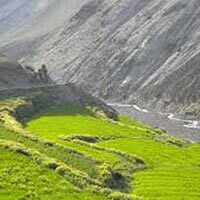 An early start is imperative for the Markha Valley Trek as there is no shade along the south banks of the Indus River until you enter the Zinchen Gorge. We will depart for Spituk from Leh by jeeps. In Spituk our team will be waiting for us with horses to carry our trekking equipment. The trek will begin along an old kucchha(un-metalled) road into a barren & dried region of Leh Ladakh with wild roses along the trail. 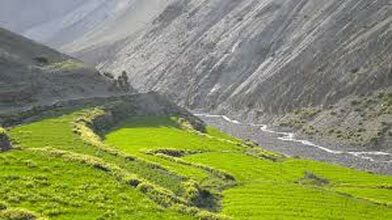 After trekking through the parched land we will enter the lush Zingchen Valley, where the Rumbak River flows into the mighty Indus. Further into the valley lies our campsite, in the two-house hamlet of Zingchen (meaning ‘big field’). Day 4: Trek from Zingchen to Ganda La Base. Today we will enter in the Hemis National Park and if we are fortunate you will get a rare sighting of a Ladakhi Ural or Arghali and other wildlife. 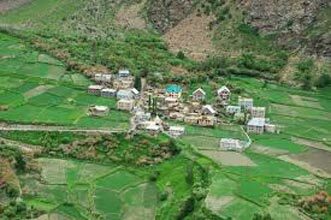 Hemis National park is home to the lynx, Ladakhi Ural (a type of goat), Arghali (great Tibetan sheep), Bharal (blue sheep), red fox, Tibetan wolf, dhole (wild dog), marmot and mountain hare etc.(link) . After paying the entrance fee, we will climb gradually through a beautiful gorge before reaching the valley leading to the village of Rumbak. At Rumbak we will stop for tea at tea house made of a parachute run by women from the same village. After a cup of warm tea we will continue past the house of Yuruche before reaching our camp at the base of Ganda La (4545m). From our campsite there are spectacular views of Stok Kangri and the whole Stok range. After a few stretching exercises and breakfast, we will begin a 2-hour ascent towards Ganda La (4900m). The ubiquitous chorten and Tibetan prayer flags mark the top of the pass, where one may see Blue sheep, Marmots and Arghali roaming the hills around us. Views of the lofty Zanskar Range and the distant Himalaya Range are great as well. After a short rest, we will make a gradual descent to Shingo and break for lunch. We will finish the day by hiking for 2-hours through a spectacular gorge before making camp at Skiu (3300m). There are ruins of an old monastery and a castle which makes a perfect setting for a photography session with deep blue skies and barren landscape of Leh Ladakh in the background.